A true wine connoisseur knows the importance of wine storage. If a wine collector has a good collection of branded and exclusive wines in his or her collection, that person needs to have a good storage area for these wines. VinoTemp has come up with a beautiful wine cabinet made of solid oak with 2 pairs of decorative and graciously designed glass doors. This piece of furniture enhances the elegant look of one’s bar counter. There is enough space in this cabinet to hold 960 wine bottles. 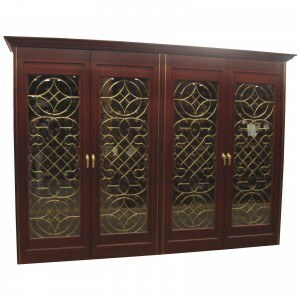 The entire inner area of this cabinet is made of unseasoned wood of oak so that the wine remains fresh and good. Tainting in wine occurs due to use of chemicals and varnish in the storage area. Digital cooling technology in this cabinet maintains proper temperature inside the storage area so the wines can remain perfect for years. This exclusive cabinet of mass 1,550 pounds is an amazing option for those who want to decorate their bar chambers at a modest price of $17,599.